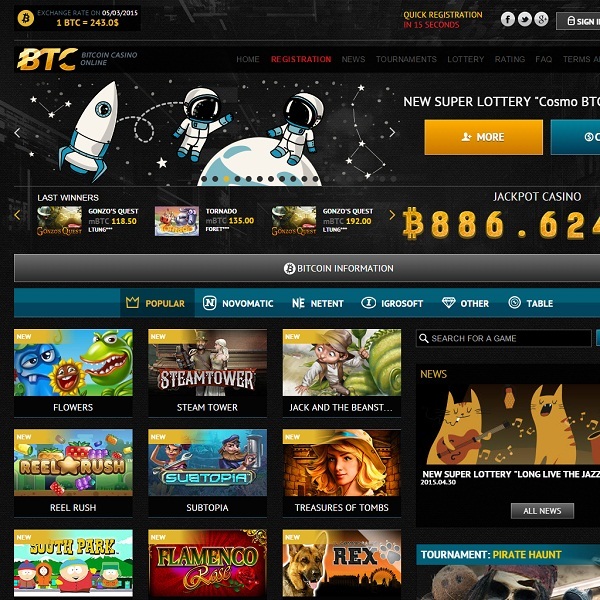 Those that make use of the digital currency Bitcoin will be pleased to hear that BTC Casino has gone live online and makes gambling with Bitcoins a real pleasure. The site is offering games from Net Entertainment, Novomatic and Igrosoft and there are a huge amount of titles to choose from. There are numerous video slots built on a variety of themes and many of them offer large progressive jackpots. Players will also find a great selection of card and table games such as blackjack, baccarat and roulette. There is also a good selection of scratch cards, video poker titles and arcade games. Upon joining the casino members have the choice of three different bonuses: 20 bonus comp points, 72 hours of double comp points or 24 hours of quadruple comp points. Furthermore, the casino offers its member live support around the clock via live chat and email.